Halloween is, without doubt, a favorite holiday for children of all ages. From toddlers to teenagers, kids are always excited to dress up as their favorite characters and go trick-or-treating with their friends. 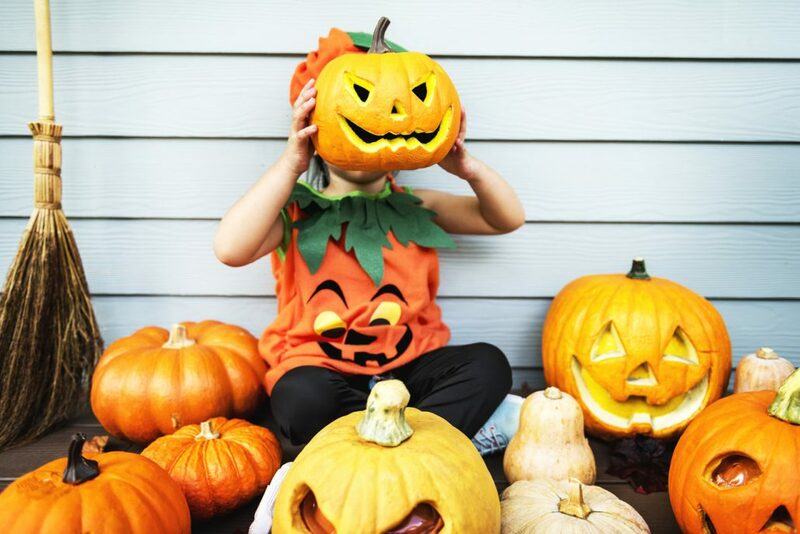 There’s also the fun of joining in the many outdoor fall activities taking place at this time of year, and the great opportunity Halloween offers for parents and children to share in the fun of creating costumes together. So it’s easy to see why studies have shown that this holiday can be so beneficial for children. To make things as enjoyable and constructive as possible for your child, there are things you can do to help you find the best possible costume and make it as appropriate as possible. You might be worried if the holiday that started out as the day of death and, in modern culture, revolves around the aesthetics of horror might be too scary for children. Of course, you should not let them visit some of the more elaborate and non-child-friendly houses of terror, but as far as costumes go, dressing them up as witches or mummies is perfectly fine! Research conducted by Jacqueline Woolley and her colleagues has proven that preschoolers of the age of 3 and 4 have a very good perception of what is real and what isn’t . And, as mentioned, dressing up like this can even turn out to be beneficial, since kids are exploring various identities, building upon their imagination and getting a better grasp of what’s real and what isn’t. The trick is to keep the celebration in the context of the holiday and use the ideas we’ll talk about to remind the kids of what is real. At the same time, they’ll be practicing their cognitive skills, such as storytelling and making distinctions between fantasy and reality. Sometimes, Halloween can be a bit “too much” for youngsters, and that’s okay. Rather than not letting them go out and have fun if you know they’ll be scared, you can prepare them and put costumes and horror elements in the context of fantasy. You can show your child how some scary costume is made and include them in the making process – they can help you with your zombie makeup, or choosing elements for the witch’s gown. Take them to the store during the day and show them around, so they can see how those elements and decorations are not at all scary when not put together. All in all, show them it’s really simply a fantasy rather than a real thing, and include them in the process of creating their costume. Finally, everything looks more terrifying in the dark, even for adults. Therefore, it’s okay to consider limiting the time for trick-or-treating to the daylight hours. Communication with your child is always the key to a good relationship. While you shouldn’t let your kids make all the decisions, you should hear them out and try to reason with them if something in their thinking or acting isn’t valid. The same goes for costumes. Some of the ideas that your child has for their costume might not be the most fitting ones: it might be a costume that isn’t suitable for their age, or simply something too expensive and hard to make. In those cases, compromise. Explain the basics of why their idea isn’t possible, but still take their suggestions – show them that you listen and consider them. If your child wishes to choose a gender-neutral costume or to “gender-bend” the costume, there are studies that say this is highly beneficial. It is not only good for girls to try out traditionally more masculine and empowering costumes (heroes, scientists, etc.) – it’s good for boys to try embracing more feminine roles and ideas, and break the mold of seeing manly costumes and professions as better than traditionally feminine ones . If, when Halloween comes, a child is not at all interested in wearing the costume you both spent a long time making, don’t push it. Maybe they can go just with the cape, and not the whole Superman outfit? Making them do something against their will can be stressful for both you and the child, and the point of the holiday is to have fun. At the end of the day, it’s not that important. Over the last few years there’s been a lot of talk about which costumes are respectful and what is absolutely not to be made into dress-up for fun. No matter on which side of the debate you are, make sure your child has the best possible time by avoiding putting them into any kind of bad situation. The best advice is to keep children’s costumes in the realm of fantasy or dress them up in career uniforms. The beauty of this holiday is, after all, in having the freedom to be as creative as possible, so there are hundreds of possibilities and characters to explore, without stepping into politically or socially sensitive areas. “New Year, New You” – the Nobel Way!